They say home is where the heart is. At Grünenthal, our 72-year history is inextricably linked to Stolberg and Aachen. Our company has been shaped by its strong roots in these two neighbouring towns and we’ve contributed to our local community since Grünenthal was founded in 1946. Even though our company has grown and expanded into new markets around the world, our headquarters – and our heart – will always be located in this corner of north-west Germany. Our first home was in the “Kupferhof” (copper yard) area of Stolberg. It was in this town, close to the borders with Belgium and the Netherlands, that our company took its first steps in 1946. Grünenthal was the first German company to synthesize penicillin. As a result of this breakthrough, we ramped up production of penicillin and made a significant contribution to ensuring a supply of this important drug as Germany recovered from the war years. By 1953, we needed more space. That’s why a bigger production site was built in Stolberg – but as our products began achieving success in markets around the world, we soon outgrew this bigger site too. Our company reluctantly searched for a new place to call home. In 1977, Grünenthal took the big step of investing in a new site located just over 10 kilometres away. Aachen, Germany’s most western city, became the site for a brand new research and development campus that underlined our commitment to business growth through scientific innovation. In fact, the site was selected because of its proximity to Aachen University. By 1986, Grünenthal took the big step of relocating its company headquarters from Stolberg to Aachen, leaving its spiritual birthplace behind – although our German sales team is still based in the Kupferhof in Stolberg today. 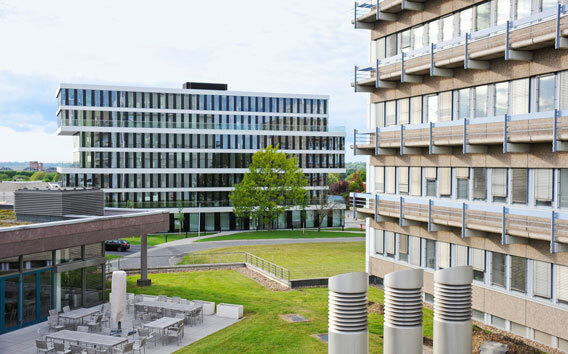 Our site in Aachen includes our Grünenthal Education building, the Corporate Centre. Since 2003, it’s been offering training for young people in fields ranging from traditional business studies through to chemistry, biology and IT. The investment in this centre demonstrates our commitment to promoting education: In fact, more than 2,100 apprentices have completed an apprenticeship at Grünenthal since the 1950’s and around 90 young people join one of our training programs every year. Of course, this isn’t the only investment we’ve made in our site since moving to Aachen. Today, we are manufacturing highly innovative medicines according to the highest standards in our industry. We expanded our production capacity by building a manufacturing centre within the grounds of our new headquarters in 2005 and expanded in 2012, 2013 and 2015 by investing in highly innovative production and research buildings. The recently acquired medicines Nexium and Vimovo have again ramped up our manufacturing activities on the Aachen Campus. For these products alone, we are now packing around 800 million tablets per year. Already back in 2005, our manufacturing site was able to produce more than 57 million blister packs every year: If you laid them end to end, they’d reach all the way from Aachen to Berlin. However, we’re not interested in going to Berlin. For Grünenthal, there’s no place like home. That’s why we’ve invested more than 131 million Euros in our campus in Aachen since 2011. Over 1,300 people work at our sites in Aachen and Stolberg – all of them committed to improving patients’ quality of life and working towards our vision: A world free of pain for patients around the world. Our investments in our site have been made alongside investments in our community. Grünenthal is supporting various projects in Aachen. They range from supporting the community with goods in the wake of the refugee crisis to supporting science projects. We opened a kindergarten in 2015. In the same year, we set up a partnership with Aachen University to develop an innovative surgical glue for wound closure. We also fund the professorial chair of palliative medicine at our local university, as part of our commitment to driving progress in palliative care in the Aachen region and around the world. Our recent investments in the expansion of our product portfolio and our constant efforts to bring new innovations to patients around the globe demonstrate our commitment to research and innovation – and to our home turf. Our campus is one of the foundations for these endeavours.